Trekker is a revolutionary system that uses GPS and digital maps to help blind persons find their way in urban and rural areas. Trekker users can pinpoint exactly where they are, learn about area attractions, and find out how to get to specific destinations. GPS lets them know their location, anywhere in the world, with continually growing precision. Fitting in the palm of the hand, Trekker offers the visually impaired greater freedom, raising their confidence in their ability to travel near or far, for business or pleasure. It also helps them access and enjoy the most valuable and interesting opportunities their surroundings have to offer. 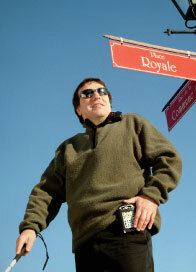 Trekker helps guide the visually impaired through their environment. It complements existing aids (white canes and guide dogs). It does not replace them. Sleek and discreet, Trekker provides information in the most natural way possible and allows users to record both vocal and written notes. A wide variety of maps are available covering most Western countries. Maps can be ordered by phone or email and delivered by download (FTP), Compact Disk or Compact Flash™ cards. User-friendly Trekker employs off-the-shelf hardware for GPS input. Trekker is fully upgradable, so it can expand to accommodate new hardware platforms and more detailed geographic information. The Maestro Option: A full range of functions in the palm of your hand. The system can be enhanced with the Maestro applications, which provide access to indispensable functions of a PDA: agenda, text documents, vocal notes, contact directory, Daisy reader (Victor Reader Pocket), and soon, media player, email manager, calculator, choice of a second language.